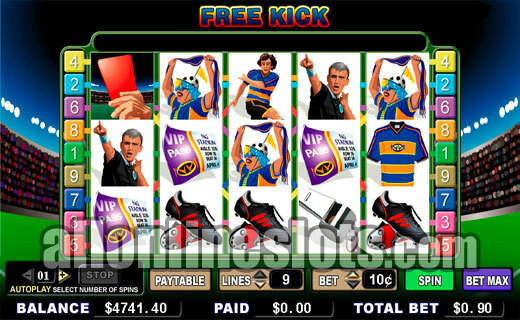 Free Kick is a football (the round ball game) theme slot from Cryptologic. It's a 9 line game with a max bet of 9 coins and a top jackpot of 5,000 coins. The red and yellow cards activate the bonus where you kick goals to win prizes. Free Kick is based on one of the most popular sports in the world - football. We are talking the round ball game here so if you are in United States we mean soccer. 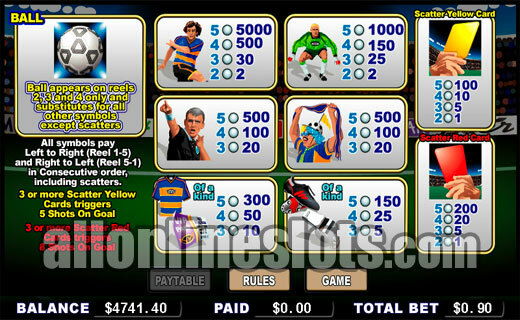 The game is a nine line, five reel video slot with a great interactive bonus screen game. Top jackpot on the reels is 5,000 coins. All of the images stay true to the football theme with symbols including referees, whistles, boots, jerseys, a player, a goal keeper and tickets. The ball is wild but it only appears on the middle three reels so it is not possible to hit five wilds. There are two scatter symbols - the red and yellow cards. Both scatters can trigger the bonus although the red cards have more value. Line up five striker (The player making the kick) symbols to win the top award of 5,000 coins. The second highest pay is for the five scattered red cards which pay 1,800 coins. This is followed by a 1,000 coin win for getting the full set of goal keepers. Overall there are a great range of mid to high level wins. To get yourself into the penalty box to shoot for the cash you need to get three or more scattered red or yellow cards anywhere on the reels. Three or more red cards give you 8 shots at goal while three or more yellow give you 5 shots. The bonus screen game is quite simple. You take the viewpoint of the player kicking for goal and have to select where to kick the ball. (View The Bonus). You have four different aiming options to choose from but it does appear to all be randomly decided. As soon as you pick your target the ball shoots towards to goal and the goal keeper dives. If the keeper saves the shot from going in you win nothing. If however you get the goal you win a random prize. Free Kick comes in coin sizes that range from 10¢ to $5. You can change the coin denomination without leaving the game so if you find yourself winning you can increase the coin size for a few spins to have a shot at even bigger winnings. Overall, Free Kick is a great game that will appeal to football fans.